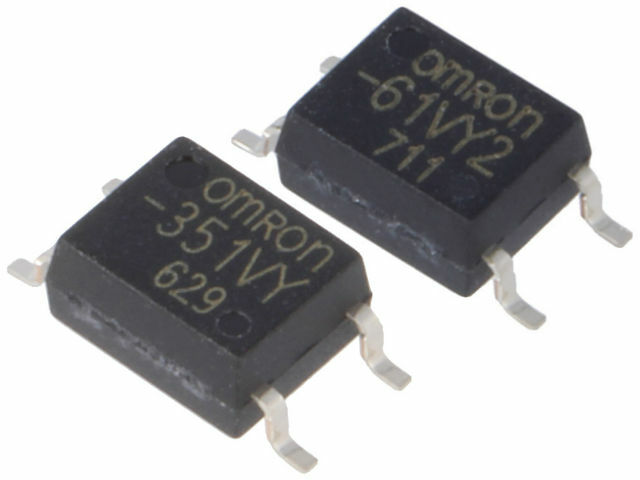 The G3VM-61VY2 (60 V version) and G3VM-351VY (350 V version) from OMRON are successors of the very popular G3VM-61G1 and G3VM-351G relays. The new versions feature improved electrical parameters and higher insulation quality. Both relays have one SPST-NO contact. These relays are characterised by wide operating temperature range from -40°C to +110°C and high sensitivity and switching speed. The trigger LED forward current is only 3 mA, and the ON/OFF times are 0.6/0.1 ms for the G3VM-61VY2 and 0.5/0.1 ms for the G3VM-351VY. These new relay models also have lower capacitance. The capacitance between terminals in an OFF state is 20 pF for the G3VM-61VY2 and 30 pF for the G3VM-351VY. This allows these relays to be used in high frequency circuits or for distorted waveforms.